The Preface is recited aloud by the priest. If we listen, we can hear it. But after the Sanctus everything is quiet. The priest prays in a very low voice. We are almost at the most holy part of the mass. You already know that the Preface is the introduction to the Canon. You know, too, that the Canon is the Consecration part of the Mass. The first three prayers of the Canon are called remembrance prayers. In these prayers the priest and people are remembering to pray for special persons and blessings. 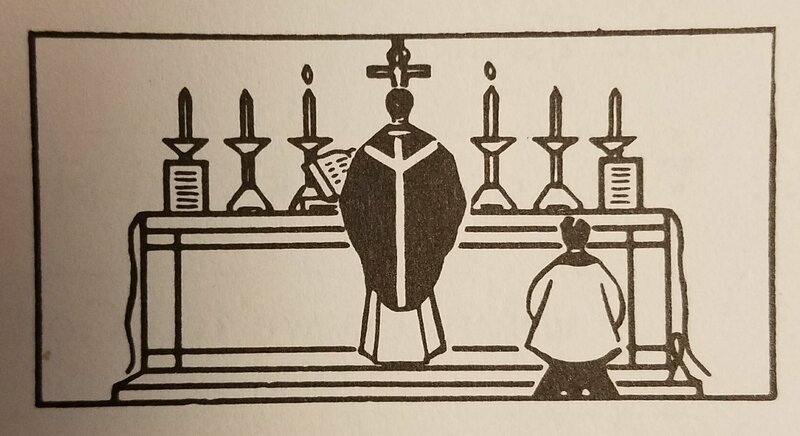 In the first remembrance prayer, after asking Almighty God to accept our gift of the Holy Sacrifice of the Mass, we ask Him for blessings on the Church. Therefore, most gracious Father, we humbly beg of Thee and entreat Thee, through Jesus Christ, Thy Son, our Lord, to deem acceptable and bless these gifts, these offerings, these holy and unspotted oblations, which we offer unto Thee in first instance for Thy holy and Catholic Church, that Thou wouldst deign to give her peace and protection, to unite and guide her the whole world over; together with Thy servant N., our Pope, and N., our bishop, and all true believers, who cherish the catholic and apostolic faith. In the second remembrance prayer, we pray for those near and dear to us. We also pray for all present at Holy Mass. Be mindful, O Lord, of Thy servants and handmaids, N. and N., and of all here present, whose faith is known to Thee, and likewise their devotion, on whose behalf we offer unto Thee, this sacrifice of praise for themselves and all their own, for the good of their souls, for their hope of salvation and deliverance from all harm, and who pay Thee the homage which they owe Thee, eternal God, living and true. In the third remembrance prayer, we ask Almighty God, because of the holiness of the Blessed Virgin Mary and the saints, please to hear their prayers and protect us. In the unity of holy fellowship we observe the memory first of the glorious and ever virgin Mary, mother of our Lord and God, Jesus Christ; next that of Thy blessed apostles and martyrs, Peter and Paul, Andrew, James, John, Thomas, James, Philip, Bartholomew, Matthew, Simon and Thaddeus; of Linus, Cletus, Clement, Sixtus, Cornelius, Cyprian, Lawrence, Chrysogonus, John and Paul, Cosmas and Damian, and of all Thy saints, by whose merits and prayers grant that we may be always fortified by the help of Thy protection. Through the same Christ our Lord. Amen.